Webster and Siren in Meenon Township. 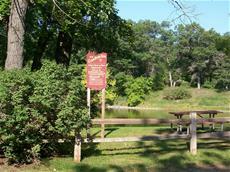 Facilities include: picnic area with outdoor grills, picnic tables, shelter, hand water pump, restrooms, and fishing benches along the Clam River. A canoe landing is located along the bank on the south side of the river, east of the dam. You can access the park from Peterson Road or from Pike Bend Road with parking on both sides.